The Galaxy S7 edge has recently launched in the UK, and it's already proven to be very popular with both reviewers and customers. Our dedicated Galaxy S7 edge portal is updated every day and covers the best deals over a variety of tariff types, but in this post we've analysed and highlighted the best deals in a little more detail. We're going to assume that you're looking for a deal that has a good balance between what you pay upfront and what you pay every month; so we're only looking at deals where you will pay a maximum of £150 for the phone at the beginning of the contract. Technically, you may be able to get a cheaper deal if you spend more than that at the beginning of your contract, but at that point you may as well buy the phone separately and get a SIM only contract with it. You can see from the graph that it's actually cheaper to go for the best deal with 6GB data than it is for anything with 1-5GB data! The deal, available from Mobiles.co.uk or e2save on Vodafone, costs £31/month and £125 upfront, and comes with unlimited minutes and texts in addition to the 6GB data. The lowest priced contract for light use comes from Mobile Phones Direct on Vodafone - 500 minutes and 500MB data for £32/month and £89.99 upfront. For the first 2 months, you actually get unlimited data. Average monthly cost: £35.75. If you'd like a little more talk time and data, you can get 1000 minutes and 1GB data for £35/month and £29.99 upfront. Again, this comes from Mobile Phones Direct on Vodafone. Average monthly cost: £36.25. If you're the kind of person who will use data to a resonable degree but isn't constantly streaming content, then you probably want a data allowance in the the 2-5GB range. The lowest cost deal with 2GB and unlimited talk time comes from Direct Mobiles on EE, and costs £32.49/month and £99 upfront. Average monthly cost: £36.62. If you want 3GB data and unlimited talk time, the best prices are again from e2save or Mobiles.co.uk, but this time on O2, costing £36/month and £50 upfront. Average monthly cost: £38.08. The cheapest deal with 5GB data and unlimited minutes costs £37.49/month and £50 upfront, from Mobiles.co.uk on EE. Average monthly cost: £37.49. As mentioned before, the best deal with 6GB data and unlimited minutes (and probably the best deal overall) comes from e2save or Mobiles.co.uk on Vodafone, and costs £31/month and £125 upfront. Average monthly cost: £36.21. If you want 11GB data and unlimited minutes, Carphone Warehouse, e2save, and Mobiles.co.uk all offer the same deal on Vodafone: £36/month and £149.99 upfront. Average monthly cost: £42.25. The best deal with 15GB data and unlimited minutes comes from Mobile Phones Direct on Vodafone, costing £45/month and £29.99 upfront. Average monthly cost: £46.25. If you need unlimited data, you have two options. 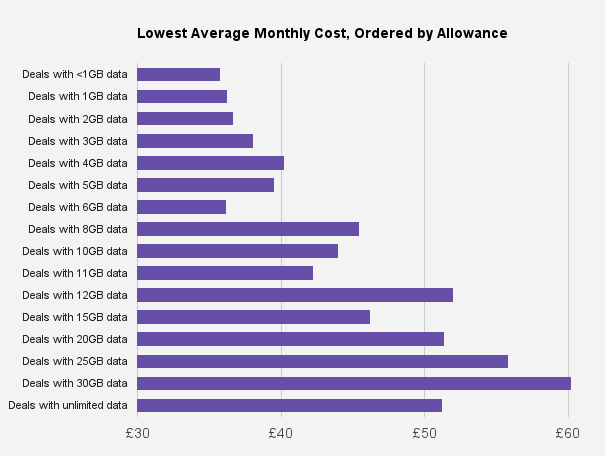 GiffGaff has a tariff that includes 'always-on' data, which means that whilst you will always have a data connection, after a certain amount of usage, the speed is throttled. This costs £46.23/month and £120 upfront. You can change your tariff at any point, which means that if you go for a tariff with a lower allowance, you'll pay less per month. Average monthly cost: £51.23. The only network that provides truly unlimited internet is Three, which costs £62/month and £49 upfront. Average monthly cost: £64.04. For the latest prices, our price comparison engine checks prices every day across over 40 retailers in the UK. Follow us on Facebook or Twitter for the latest deals and information.